You’ve probably heard the expression “a tired dog is a well-behaved dog.” It’s been around for a while, and it’s become increasingly popular since one particular “trainer” on television advocates the use of a treadmill for dogs who can’t be given regular exercise. But physical exercise isn’t the only way to tire a dog out. Mental stimulation (ie, training) is incredibly tiring to dogs, as are fun dog sports like agility, discing, lure coursing, etc. But another great way to tire your dog out is to PLAY with him! Dogs have different play styles, so not every dog can play with every other dog. Some just aren’t compatible players, and that’s OK. But when playing with humans, there are several broad categories of games that most dogs will find enjoyable. Mind games – best for dogs on kennel or crate rest or whose movement is otherwise limited. Chase – games that involve you and your dog chasing after each other. Physical contact games – generally not recommended and far more common with men than women, these are rough-housing type games – play wrestling, etc. There are many misconceptions about tug, especially in pop culture dog training. Currently popular trainers will say that tug encourages your dog to be “dominant” over you; that you should always win at tug because the winner is the leader of the pack; that tug encourages aggression. None of these are correct or true. 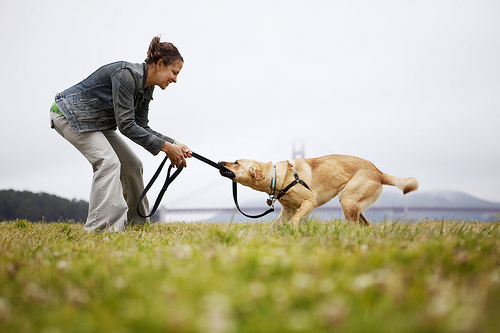 Tug is actually an excellent physical activity for dogs involving the full body and its musculoskeletal system. It’s physically exerting for them, and it can be done in smaller spaces such as apartments, or on rainy days when you and Fido don’t want to venture outdoors for extended periods of time. It’s a great game to incorporate into training and behavior modification. It’s a good alternative for people who want to roughhouse with their dog. And it’s a safe way to redirect the teeth of a dog who tends to get “mouthy” when playing. You control the good stuff. This means you start and stop the game. No grabbing. Don’t allow play to begin if your dog grabs for the toy. Teach him to wait for a cue for the game to start as well as to release the toy on command. Tug using side-to-side motion only, as up-and-down movement can cause injury to the spine and teeth. Also make sure the force you use is in proportion to the dog’s size and weight. Use time outs if needed. If Fido becomes mouthy and can’t be redirected to the toy, stop play immediately. Do not reinforce mouthiness. The same goes for jumping up in order to reach the toy or trying to grab it out of your hand. 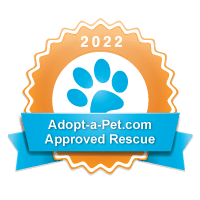 Since most of our country is going through a particularly harsh winter, a lot of dogs and their people are probably suffering from a little bit of cabin fever right about now. Dogs need to burn off a ton of energy and humans want to stay warm and dry as much as possible. So go grab a long rope toy and start playing tug with your dog! You’ll both feel better for it! Pat, Miller. Play With Your Dog. Wenatchee, Wash: Dogwise Pub., 2008.